Bill Belichick and Co. had two weeks to prepare for their divisional-round game against the Los Angeles Chargers. That’s usually a recipe for disaster for opposing teams in the playoffs. Most figured the Chargers and defensive coordinator Gus Bradly would be able to combat this by changing up their MO on that side of the ball. In the past, Los Angeles had played cover three or zone defense. This means that the defense has put more defensive backs on the field — seven a majority of the time in last week’s win over the Ravens. That type of strategy is not going to work against Tom Brady in what was ultimately a 41-28 Chargers loss. It’s something that CBS broadcaster Tony Romo and others focused on early during the game. Finding soft spots in Los Angeles’ defense, Brady’s first eight passes averaged 0.6 yards in the air. Despite this, said passes went for 84 yards. 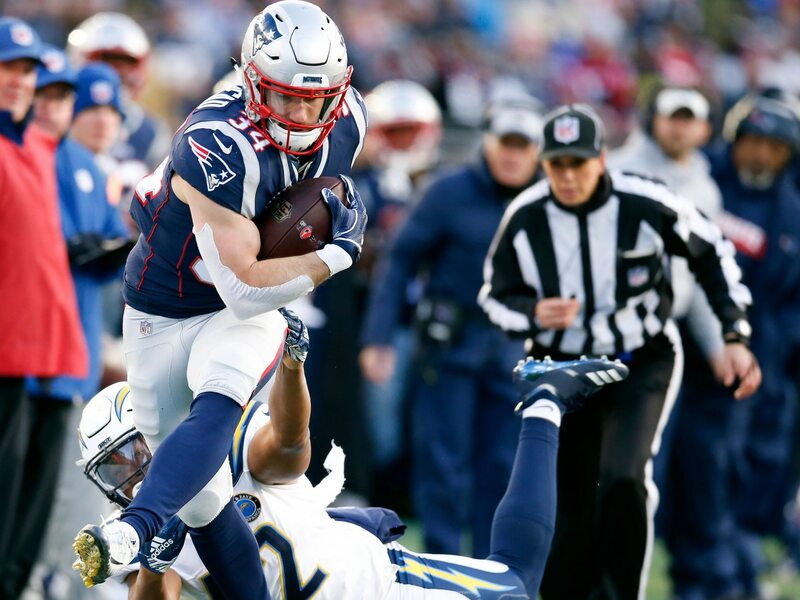 The Chargers failed to change their scheme — leading to New England scoring a touchdown on its first four possessions. For his part, Brady completed all but four of his passes for north of 200 yards in the first half alone. Utilizing this strategy against a rookie run-first quarterback like Lamar Jackson is one thing. Doing so against a grizzled veteran in that of Tom Brady is a completely different thing. This made it easy for Brady in the first half. He could hit his spots and hope for yards after the catch — a true West Coast Offensive philosophy that was made popular by the late-great Bill Walsh. It’s something we saw defenses utilize against the 49ers during their dynasty of the 1980s. Opponents somehow thought if they went zone against Joe Montana, it would work. More often than not, it didn’t. These Patriots are no different. Sure they run a variation of the Erhardt-Perkins offense. But it still requires yards after the catch. If you’re playing soft zone, you’re enabling Brady to dink and dunk down the field. That’s what he’s been best at throughout his career. Los Angeles’ defense also failed in holding contain throughout the game. Rookie running back Sony Michel went for 129 yards and three touchdowns on 24 attempts. Catch-first running back James White caught 15 passes for 97 yards — paying homage to former 49ers running back Roger Craig in the process. Sure the Chargers changed their philosophy in the second half. They went with more basic sets — holding New England to six points in the final two quarters. That doesn’t change just how horrible Bradley’s scheme was in the first half. It led to a frustrated Philip Rivers and the Chargers finding themselves out of the game before the initial 15 minutes ticked off. Let’s just hope the Kansas City Chiefs have a better strategy for the AFC Championship Game next weekend. If not, the Pats will roll to their ninth Super Bowl under the evil genius that is Bill Belichick. As it relates to the Chargers, they now head into the offseason wondering what could have been. If Bradley employed a different strategy on defense, would things have turned out differently? It’s this unanswered question that will haunt the Chargers for a while.